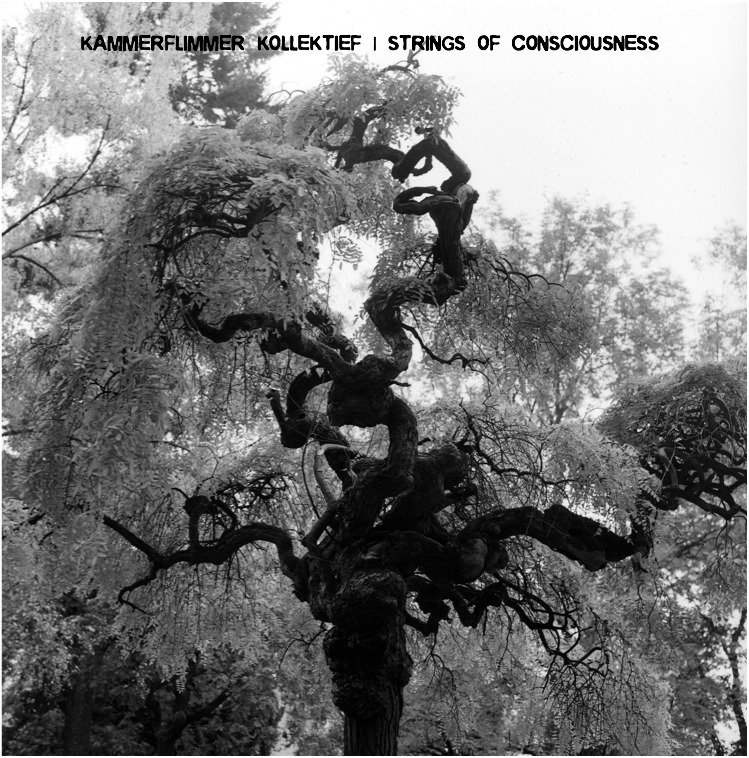 KAMMERFLIMMER KOLLEKTIEF / STRINGS OF CONSCIOUSNESS: dto. Split-10″ by KAMMERFLIMMER KOLLEKTIEF & the cosmopolitan ensemble STRINGS OF CONSCIOUSNESS. The PARAKUSIS series on Karlrecords kicks off with a split-10” by two great bands: Mastermind Thomas Weber’s KAMMERFLIMMER KOLLEKTIEF have refined their hybrid style of folk, (free) jazz, subliminal drones and minimalistic electronics through the years. This EP introduces for the first time the repetitive, shamanistic vocals of Heike Aumüller which catapult the listener into the psychedelic depths of outer space. Their 2nd track marks the reentry into the ether – a relaxed, ambient journey but not without a moment of friction: a Cale-esk viola and hard-bowed contrabass hint at the fugacity of all earthly beauty. A magical trip, an abundance of timbres – KAMMERFLIMMER KOLLEKTIEF play their very own music, more coherent, consistent and better than ever. STRINGS OF CONSCIOUSNESS are an international ensemble consisting of 11 members who have worked with such highly reputed and diverse musicians as David Thomas (Pere Ubu), Phil Durrant, David Toop, Scanner, Frank Black and / or Luc Ferrari. Laptop, guitars and percussion are complemented by saxophone, trumpet, harp, vibraphone, making the orchestration jazzier and yet similar to KAMMERFLIMMER KOLLEKTIEF . STRINGS OF CONSCIOUSNESS melt acoustic and electronic textures and create imaginary landscapes in the listener’s head. Thus they live up to their name (derived from stream of consciousness)! Bucolic moods, fed by postrock, electronics and jazz like Alice Coltrane e.g. – thrilling beauty without a trace of kitsch.